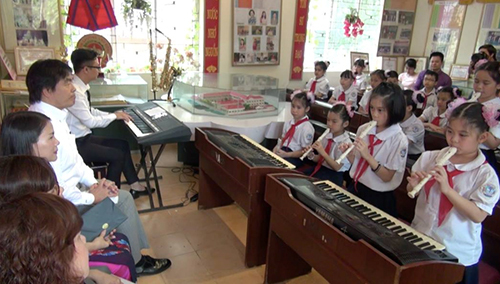 Yamaha Corporation is implementing a project to introduce instrumental music education in primary and secondary schools in the Socialist Republic of Vietnam (hereinafter, Vietnam). This initiative has received official recognition under the "Pubiic-Private Initiative to Disseminate Japanese-Style Education Overseas" ("EDU-Port Japan") of Japan's Ministry of Education, Culture, Sports, Science and Technology (hereinafter, MEXT). In Vietnam, no "Course of Study" is provided in the primary and secondary schools for teaching pupils to actually learn to play musical instruments. The music subject currently provides four contents; singing, general knowledge of music, music theory, and solfege. Yamaha has been spreading the merits of learning music through playing instruments to many schools in various countries and regions. 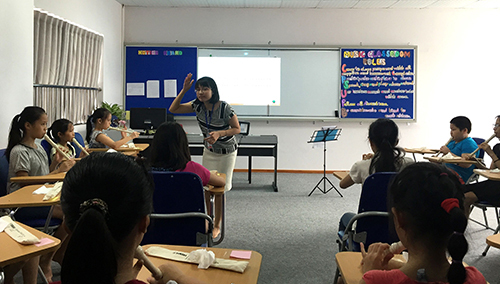 Building on this experience, Yamaha, in cooperation with Vietnam's Ministry of Education and Training, began to provide support for the instrumental musical education in January 2016, with an eye to the revisions in the "Course of Study" for primary and secondary schools that are scheduled in 2018. Beginning this fiscal year, MEXT began "EDU-Port Japan" through a framework involving collaboration of Japan's public and private sectors. The objective of this project is to spread overseas the Japanese educational system, which has drawn considerable positive attention from abroad, through an "all-Japan" public-private collaborative effort. This project is divided into four parts: A public-private collaborative platform, country-specific working groups, international forums, and pilot projects. Recently, Yamaha's initiatives were selected as a certified project of "EDU-Port Japan". As a result, it is now possible to move forward with these education initiatives with the support of MEXT. Aiming to provide opportunities for the children of the world to become acquainted with the beauty of music, Yamaha will develop the project, including improving music textbooks and preparing teacher training programs in Vietnam, drawing on the knowledge gained through collaboration with Yokohama National University and KYOIKU GEIJUTSUSHA CO., LTD. (one of the music textbook publishers in Japan), and other groups and corporations.